The US Coast Guard Waste Water Treatment Facility and Training Center (also known as “TRACEN”) -- the Coast Guard's largest West Coast Training Center -- is located in a rural section of northern California, eleven miles west of Sonoma County’s town of Petaluma. With thousands of students, residents, and other personnel living, learning and working at the base, TRACEN -- like a small city -- requires its own system to dispose waste. The new Training Center replaces an existing, non-compliant Water Treatment Plant, and functions as a school for Coast Guard personnel with a campus population of 1,400, projected to expand to 2,000 over the next nine years. 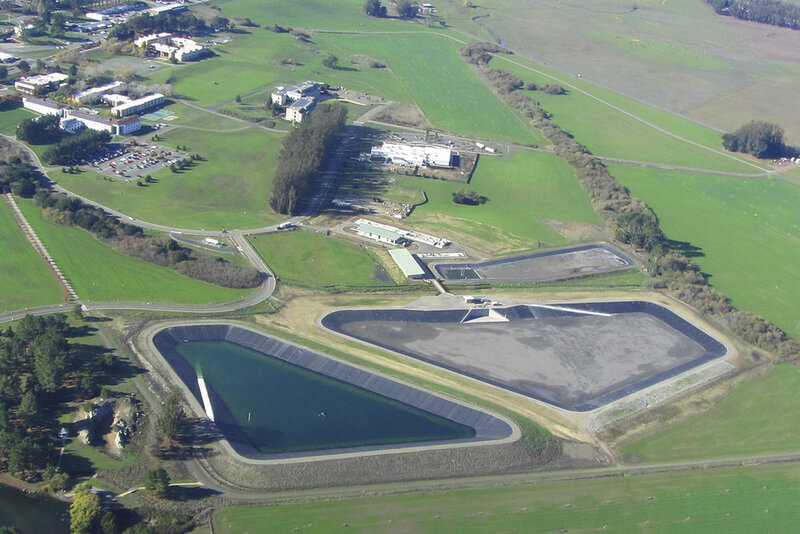 A complex of three buildings (The Operations Building, Sludge Biosolids Facility, and Agricultural Pump Station -- a total of 10,651 SFT) were built in conjunction with a series of treatment basins that participate in various stages of the waste water management process. The planning and design of the facility melds innovations from engineering, landscape architecture, and building design, to clean and store all of the Centers’ waste, allowing recycling and reuse of the resources on site, saving millions of gallons of drinking water annually, and utilizing the waste-water (recycled into precious clean water) for irrigating meadows, fields, and trees, as well as land on which food can be grown. The Stemple Creek traverses the largely undeveloped site, leased to local farmers for livestock grazing, hay production and other dairy operations. Although picturesque, unless mitigated, these livestock operations contribute to several problems, which plague the site. 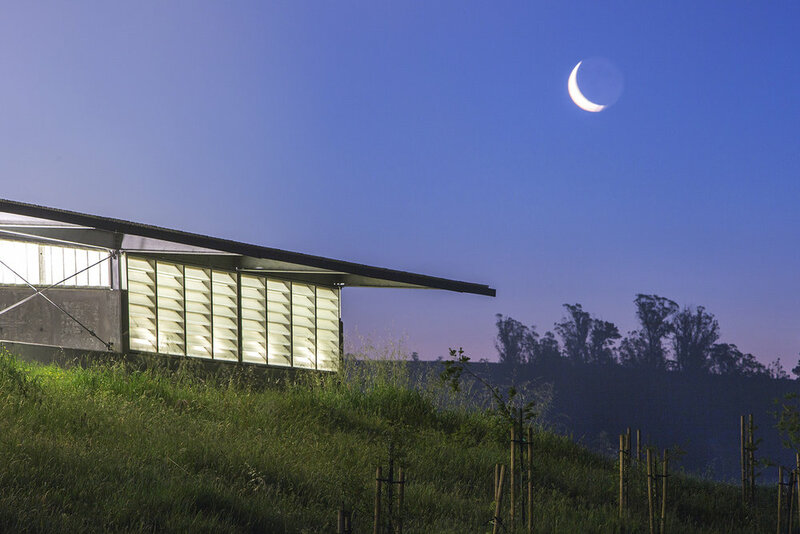 The new facility beautifies the landscape, restores the riparian stream, enhances wetlands, and saves potable water by expanding the treatment, storage, and irrigation capacity of the base. The design includes the construction of new and expanded storage ponds to accommodate 215-acre feet of seasonal storage; removal of an existing 72-inch culvert from the drainage channel; construction of a new bridge across the drainage channel; installation of an agricultural irrigation system, restorative planting and a new landscape irrigation system. The project includes master-planning, as well as the repair and restoration of the related systems, both natural and man-made. The upgraded facility meets the complex programmatic needs of the Water Treatment Facility, including a head-works structure, equalization basin, secondary Biological Nutrient Removal (BNR) treatment plant, drying beds, expanded storage ponds, spray fields, and tertiary treatment through on-base landscape irrigation. The seasonal storage capacity is increased from 13.7 million to 70 million gallons, while recycled water disposal is increased from 28 acres to approximately 79 acres of agricultural spray-fields (secondary effluent) and 25 acres of landscape irrigation (tertiary effluent). The self-sustained project saves 70,000 gallons per day, and 20 million gallons annually, of potable water from baseline and in the process, creates a beautiful, scenic, sustainably-restored environment.